Is your spa business on the right track? I recently read some articles about how to drive spa business and that spa managers of today may have the ‘soft skills’ but lack the ‘hard skills’. There’s an implication that the hard skills are the most important in business and that the next generation of spa managers will all have an MBA and speak the language of finance, marketing and HR. It’s believed that the rest of us will be left behind if we don’t quickly get on the bandwagon. Well, I would suggest that this thought is missing the point of what spas do and what is truly needed to drive business. We need more connection to our hearts and less to our minds. No amount of business acumen will ever replace the power of intention and touch when it comes to winning and retaining the business of our clients. I often look at the audit reports which would have you believe that success is defined by responding to a phone call within three rings or upselling treatments. However, they are a mechanical checklist that completely miss the quality of interactions and would be better suited to the review of a McDonald’s franchise than providing any meaningful insight into a spa operation. * What are you doing to support the growth of your team? * What are you doing to develop yourself? * Where do you currently see the opportunities to make your spa unique? If you’re focusing on these things, your business will be successful and you’ll continue to be relevant in an ever-changing world, as you’re connected to what really matters. Could spa associations become hubs for mentorship programmes? Mentoring is currently a hot topic in many mainstream magazines. Even Michelle Obama has been interviewed by US magazine More about “her deep commitment to mentoring and why it’s so important to her”. Mentoring provides a unique forum for industries, including the spa sector, to grow and educate people. The Spa Management Career Trends Survey, a recent report of 548 spa managers, has highlighted how mentoring is viewed as an important element in running a successful spa facility. The survey was put together by a GSWS sub-committee – the Global Spa Management Education Task Force – which feels that spa associations around the globe are well-placed to provide a hub for local mentor/mentee connections. It also uncovered some websites which provide excellent information on best practices and how to start a mentor programme: www.mentorscout.com and www.mentoring-association.org. The committee members are now looking into what a spa industry mentorship programme might include and how they can take matters further. They welcome input, so if you would like to be involved, please contact lori@hutchinsonconsulting.com. See more survey results on p26. We strongly agree with Spa Business’ article which highlighted the benefits of skincare prescription (see SB13/2 p94). It’s vital to educate customers about their skin’s needs and it makes good business sense too – our figures show that just a 15-minute complimentary Elemis SkinLab analysis can increase product sales by up to 20 per cent year on year. 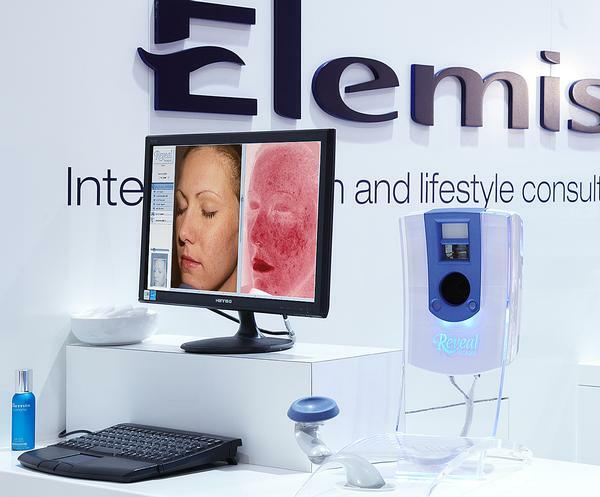 Elemis has been using the SkinLab system, which uses the Canfield Imaging machine, and our own skin, body and lifestyle computerised questionnaire and prescription, since 2006. It allows the therapist to see the condition of a client’s skin both on, and below, the surface. A series of six images will assess UV exposure (characteristic of photo damage), open pores, areas of dehydration, evenness and porphyrins (evidence of bacteria lodged in pores which can lead to acne, fine lines and wrinkles and blemishes/spots). This allows the therapist to pinpoint areas of concern and suitable products. The client also takes away a printout of their skin analysis and a prescribed product list, highlighting their bespoke ‘at home’ programme. This is an integral part of helping the therapist to build rapport and to provide expert advice without the need to push for a sale. It’s a tool that helps to establish a better level of care, confidence and trust which also results in repeat bookings, as well as increased retail sales. Based on the success we’ve seen, the refurbishment and relaunch of the Elemis flagship day spa in London, UK, in 2014 will include a SkinLab in each of its eight treatment rooms (rather than just one in the main reception). Our aim is for 35 per cent of total revenues to come from retail sales.